In this section we will try to keep you up to date with general advice and new medical research. Obviously we cant always keep up with everything that is going on, so if you know about something you think might be useful or, if you have read something that you think other Sickle Cell or Thalassaemia sufferers will be interested in then please email us and share it. For more general information about what Sickle Cell is we recommend Your Genes Your Health website. What are Sickle Blood disorders? Sickle Cell Anemia and Thalassaemia Major are inherited from both parents who are carriers of the trait. If both parents have the trait, each child has 25% chance of being born with the usual haemoglobin, a 25% chance of being born with the full blown disorder and a 50% chance of being born with Sickle Cell or Thalassaemia trait. 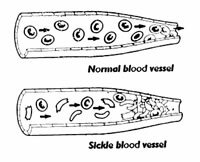 Sickle Cell and Thalassaemia are inherited blood disorders in which the red blood cells are sickle shaped or are abnormally small and therefore can not function like normal red cel'sl should. They should be round shaped like a donut. The change of shape is caused by the haemoglobin in the blood cell being abnormal. Haemoglobin is a special protein in red blood cells that carries oxygen around the bloodstream. A continuous supply of oxygen is essential for life. Oxygen is carried from the lungs to all parts of the body by the blood. In Sickle Cell disorders if the oxygen content in the haemoglobin is low, the haemoglobin sticks together to form long rods inside the red blood cells making these cells rigid and sickle shaped (hence the name). Normal red blood cells can bend and flex easily. Because of there shape ‘sickled' red blood cells can't squeeze thought small blood vessels as easily as the almost donut shaped normal cells. This can lead to these small blood vessel's getting blocked which then stops the oxygen from getting through to where it is needed. This in turn can lead to severe pain and damage to the organs, such as the liver, kidneys, lungs, heart and spleen. These attacks are called crises. Another problem is that red blood cells containing sickle haemoglobin do not live as long as the normal 120 days which results in a chronic state of anaemia. It is a myth that these disorders only effects people of the black and ethnic minorities, it is not an exclusive illness! However Sickle Cell Disease mostly affects people from the African, African Caribbean, Italian, Greek, and Arab communities. Thalassaemia mostly affects Asians, Greeks, Italians, Africans, as well as Caribbean and Hispanic communities. A special blood test (haemoglobin electrophoresis) can tell you whether you have a Sickle Cell or Thalassaemia disorder or are a carrier of the trait. It is now also possible to test an unborn child to detect a haemoglobin disorder from as early as 11 weeks of the pregnancy. Unless you have this special test you may never know you carrier status (or your baby's), we can't stress how important it is to know your own trait status! We, The Merton Sickle Cell & Thalassaemia Group (MSCTG) based in Mitcham, Surrey are an independent innovative and dynamic group who campaigns on behalf of Sickle Cell Anaemia and Thalassaemia (SCADT) sufferers against injustice and discrimination. We are a close knit team made up of 6 Management Committee members, 1 Project Manger – Eula Valentine, an Administrator Finance Officer and a handful of dedicated Volunteers. We currently give support to over 150 families who feel that there is inadequate service provision that caters for their specific needs. The reason they feel unsupported is due to a lack of specialist knowledge amongst medical staff, governmental departments and the general public. When presented with this situation, often diagnosis is made without really fully understanding the cause or resolve. MSCTG realises our mission by working empathically to empower individuals to obtain the necessary services thus enabling those individuals to live their full potential . As a part of our work we strive to raise awareness, thus giving insight to what Sickle Cell is. We write this article to separate the facts from the fairy tales. Q What is Sickle Cell? Q What are the symptoms of Sickle Cell? Sicklers suffer from crisis : Severe attacks of pain that can often occur in the joints, bones and chest. Crisis occurs due to the crescent shape of the red blood cells which block narrow blood vessels. This can be a very painful experience, however the regularity and degree of discomfort differs from one individual to another. This blockage reduces the amount of oxygen circulating around the body which can have a detrimental affect on the organs. This causes the cells to break down even further which leads to the Sickler becoming anaemic and weak. This in turn lowers the tolerance of the immune system which results in the individual being more susceptible to infection. It must be noted that as well as a sickler suffering from crisis periodically, they can often experience daily pain in joints, etc. which needs to be controlled by prescribed medication. Q Is there a cure? There is no real cure for Sickle Cell although a small percentage of bone marrow transplants in infants have proved to alter the child's sickle status for the better. However, success is not guaranteed with this kind of transplant and there is a risk of death. This surgery is not recommended practice for adult sufferers and initially depends upon a DNA match. There are precautions that one may take to best avoid a crisis. The main triggers for a full blown crisis are cold, damp, stress and strenuous exercise. It is important for a Sickler to ensure that they are appropriately dressed (particularly in winter), take medication, avoid self exertion, eat a well balanced diet, remain adequately hydrated and practice relaxation techniques. Sadly there are cases where crisis is inevitable and so in this instance, one must seek immediate medical attention. Q What kinds of treatments are there? There are arrays of treatments to help alleviate the symptoms of Sickle Cell. Medication, i.e. antibiotics and pain killers, blood transfusions and surgery (bone marrow) are all methods that can help towards pain management. Psychological support is of course vital to all Sicklers' well being although unfortunately this is often neglected. Hydroxyurea is a drug treatment which reduces the clumping effect of sickle cells and therefore the blockage of blood vessels is less likely to occur. It also reduces the number of white blood cells in a Sickler. This can prove to be beneficial as white blood cells release chemicals which lead to inflammation. This treatment does not work for everyone but many have reported that crisis pain has been reduced or is less regular. Q Can you catch Sickle Cell? Sickle Cell is an inherited disorder and therefore the chances of an individual having Sickle cell are wholly dependant on the genes of their parents. This disorder is not contagious. Q Can I be tested for Sickle Cell? The straightforward answer is yes. You may request a Haemoglobin electrophoresis from your GP who will then refer you to your hospital for this simple blood test. This is a quick and easy process which is over in a matter of minutes. This test will determine your Sickle status (whether or not you have Sickle Cell trait or disorder). 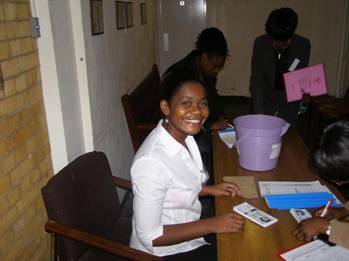 Pregnant women may also opt to have a pre-natal test to find out the sickle status of her unborn child. There is a one out of four chance that her child will have Sickle Cell disorder if both her and her partner has the Sickle Cell trait. Q Do only African and Caribbean people get Sickle Cell? Sickle Cell does not discriminate! The sickle gene is not exclusive to those of African and Caribbean heritage. There have been instances where Caucasians, Asians and Europeans have also inherited this defective gene and no, it is not necessarily a result of being from a mixed African or Caribbean background. Q Is it true that if you have Sickle Cell that you can't get malaria? Having Sickle Cell disorder does not make one immune to Malaria. If a Sickler is infected with the Malaria parasite, it increases the sickling in the blood which can lead to serious illness. This is why it is important for a Sickler to take anti-malarial tablets when travelling to areas where Malaria is prominent. It is thought that individuals who carry the Sickle Cell trait have some protection against Malaria; however it is also imperative that anti-malaria tablets are taken when necessary. Q Can Sickle Cell lead to other complications? Yes! It can lead to various different health complications of which many are quite serious; however, it is vital that patients regularly attend their clinical appointments. This article has briefly highlighted some of the difficulties that can occur with Sickle Cell disorders. We hope then that you can appreciate the added strain of being a Sickler when as an employee they are told that they are not committed enough to the job, or as a school child they are told that they are just skiving, or when they are refused Disability Living Allowance due to the fact that Sickle Cell just doesn't seem to be a good enough reason to receive financial help, and finally, when they are told by medical professionals they are NOT IN PAIN! Can you imagine the social exclusion and financial difficulties that one can face when others fail to understand the complexities of Sickle Cell? So next time you meet a Sickler do not be fooled by their proud exterior as we are all guilty of wearing the mask that grins and lies .